AARP is the nation’s largest nonprofit, nonpartisan organization dedicated to empowering people 50 and older to choose how they live as they age. From their publications to their YouTube channel, to their member events, AARP shares the information that makes life after 50 richer. AARP also produces the nation’s largest circulation publications - AARP the Magazine and AARP Bulletin. In fact, AARP The Magazine is America’s most read print magazine. Over the past decade, ATM has risen from America’s fourth most-read magazine to No. 1, while increasing readership by 4.4 million. 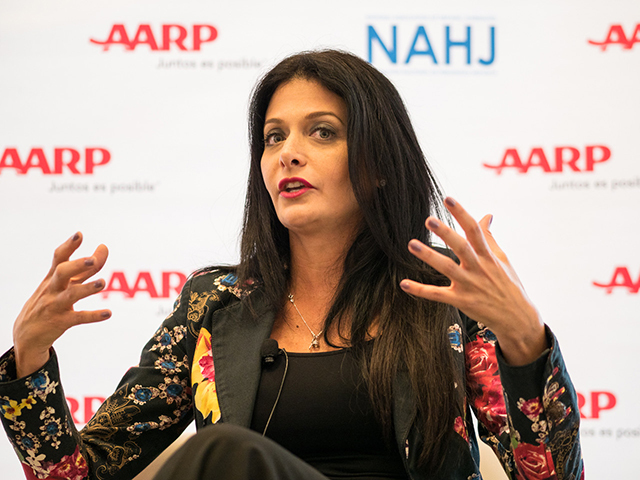 AARP has more than 38 million members in the United States, of which they estimate approximately 1.2 million (households) are of Hispanic origin. More than 500,000 Latinos turn 50 every year, and the Latino 50-plus population is growing three times faster than the general 50-plus population. Leading the discussion is the esteemed journalist Maria Elena Salinas. For more than three decades Maria Elena has been a prominent voice in journalism in the United States. She has been recognized with numerous professional awards, but perhaps more importantly, she is universally recognized by Hispanics across the country from her 30 years as anchor of Noticiero Univision. And the journey continues on another stage. These days you can see her on Investigation Discovery’s the Real Story with Maria Elena Salinas. Among the panelist were Maria Marín, Bárbara Serrano, and Yvette Peña.